Delivering products is an essential part of almost any type of business today. In fact, ever since the e-commerce industry came into picture, small and medium enterprises (SMEs) have joined large businesses – machinery manufacturers, wholesalers, flooring companies and builders – in requiring road transportations to fulfil their deliveries. Although some businesses may have their own fleets of vehicles, many prefer to outsource their delivery to third parties for good reasons, particularly in relieving them of the worry about fuel costs, licenses and other fees for driver training and taxes. However, along with these benefits come a few possible drawbacks. For instance, any unprofessional customer delivery can do untold damage to your business reputation. So, your choice of courier service provider is crucial if you want to be perceived as trustworthy and professional. To avoid this drawback, you need to find the right courier service. And with the countless options available, the challenge is in choosing the the best one. Need help? 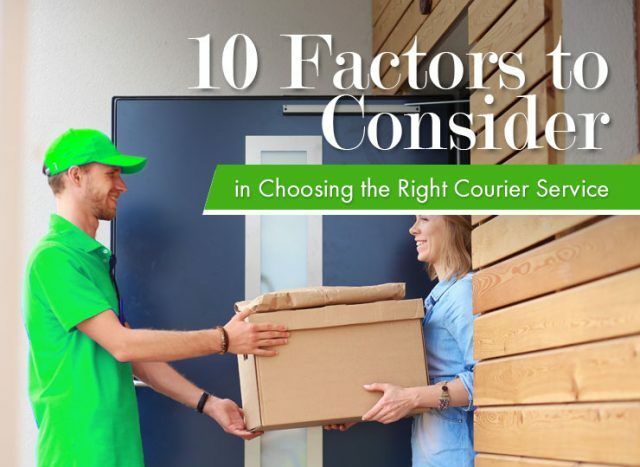 In this article, we listed some of the factors you need to consider when deciding for the right courier service. The first and perhaps the most important factor to consider is the speed of delivery. For most businesses, the time the shipment will be fulfilled is critical. So, aside from considering the average speed, you should also look into the range of speeds the courier can deliver at. If your business accepts orders from different locations across and outside the country, you need to determine whether your courier can fulfil them. Find a service provider who also offers international deliveries so you’ll not have to switch couriers when the need to send parcel overseas arise. Further, you should also look into the flexibility of services they offer. Aside from merely fulfilling orders, some couriers offer a full range delivery services including packaging, warehouse management, logistics and multi-drop deliveries. So, you also might want to take these additional offerings into consideration. Regardless whether you ship fragile items or not, the way your courier handles them is important. There have been numerous cases of damaged items during delivery, and you don’t want to risk that. So, when deciding for whom to entrust your parcel, make sure you at least read consumer reviews first. Now that you’re at it, you might as well check how long the courier has been in business. Ideally, you should go for a company who is established and reliable. After all, as far as customers are considered, your reputation, and not the courier’s, is at stake. Aside from the attitude towards care, your customers will also form an impression of your business based on how the courier present themselves. So, the amount of effort they put into the appearance of their vehicle and personnel is another thing to consider. How you put weight to this factor depends on how important it is for you to track the delivery at all times. This capability is particularly helpful when your customer needs a specific time when they can expect the package to arrive. When sending valuable goods or confidential information, a shipping insurance gives you the confidence that you can file a claim in case they go missing or get damaged while in transit. A courier that provides a clear and detailed insurance policy is definitely a more preferable option. Shipping rates is probably the most interesting one on the list. Although you may go for a courier with the cheapest rates, it doesn’t guarantee excellent service. Like any other thing in life, you get what you pay for with delivery. So, instead of the cheapest, opt for one that gives you the best value for money. When you have a concern about your delivery that needs to be addressed immediately, it’s relieving to know that there is someone on the line to sort it out. It is the reason why it’s important to partner with a courier that has 24/7 support. Here at Green Courier, we value the time and effort our customers put in their packages – and as a leading eco-friendly courier in London, it’s our goal to complement this hard work by fulfilling the delivery in the most efficient and sustainable manner. Partner with us today!